Yesterday and today were both very hot and dry. We watched yesterday’s stormy weather to the north, but only got a slight drizzle here. 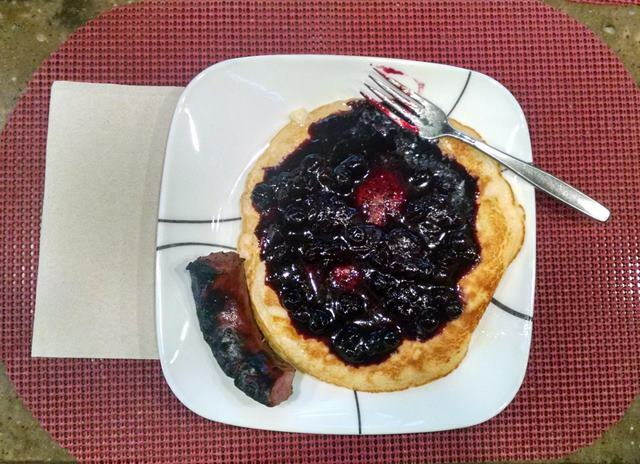 About the only thing of even the least bit of interest we did yesterday was make blueberry pancakes and top them with our homemade honey-blueberry syrup. The rest of the day was spent trying to stay cool and working on estate paperwork. Today, however, we enjoyed a very good contemporary service at Forest Lake UMC, which is about a block away. The sermon was based on Act 8:26-40 and was entitled “Lay Mission.” It reminded us that we are all ministers and that we should practice our ministry all week long. We noticed the permanent graphics above the stage “Gather, Grow, Go, Give” and how well the message reflected those instructions. After the service we drove back to Deerlick Creek Campground and looked around again. Then we tried to stay cool and worked on some accounting stuff. Oh, we did walk three miles this morning and another three miles this evening.